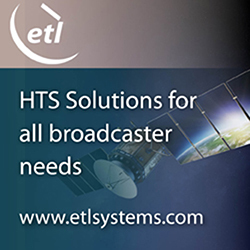 Teledyne e2v has provided a key component for the highly customized ultraviolet laser detector for the Atmospheric Laser Doppler Instrument (ALADIN) on the European Space Agency’s Aeolus Satellite that launched on August 22. Contracted by Airbus Defence & Space, Toulouse in 2003, with flight model deliveries in 2005, Teledyne e2v developed a unique Charge Coupled Device (CCD) type detector specifically for the mission. The CCD69 ultraviolet detector blasted off into space aboard Aeolus, marking the conclusion of a 16-year project for ESA. Thiss mission is to gather wind data profiles of the Earth. The data will improve the accuracy of global weather forecasts. Traditional methods to gather this type of data involve deploying weather balloons, cloud tracking, and monitoring temperature and surface winds. Instead, the Aeolus satellite will employ a very powerful laser in an instrument known as ALADIN. ALADIN works by emitting an ultraviolet laser beam through the Earth’s atmosphere and measuring the reflected return signal from particles, or aerosols in the atmosphere. Teledyne e2v, in collaboration with Airbus Defence & Space and ESA, has developed an innovative type of detector that simultaneously measures the distance of the returned ultraviolet laser pulse to resolve the altitude of aerosols in the atmosphere, and the Doppler shift that equates to the wind speed at each altitude. The returned signal is typically extremely weak, however the detector has the capability to add together a number of returned pulses to improve the accuracy of the measurements. Aeolus is the first satellite of its kind to utilize this type of technology in space. Artistic rendition of ESA's Aeolus satellite on orbit. Image is courtesy of Airbus Defense and Space. 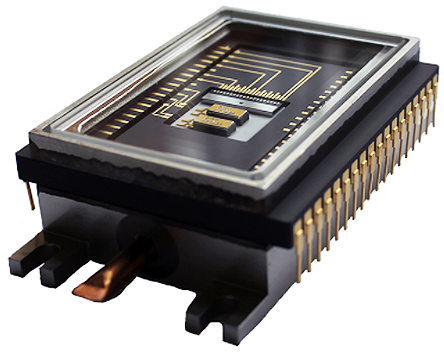 Teledyne e2v’s detector consists of a 16x16 pixel CCD with a novel storage region that accumulates the signal from several successive laser pulses. The detector is housed in a hermetically sealed package with an integrated Thermoelectric Cooler (TEC) that uses the Peltier effect to transfer heat away from the sensor. The CCD detector is optimized through a backthinning process (a key capability of Teledyne e2v) to provide a very high detection efficiency at the laser wavelength of 355nm. 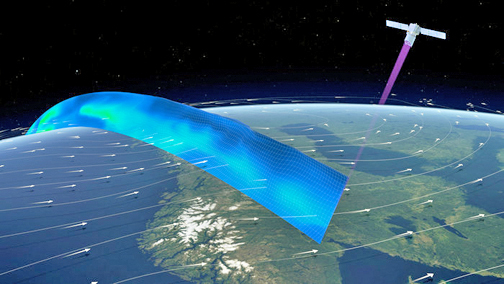 The data collected by this Earth Observation (EO) system will calculate wind speed and atmospheric pressure changes. Meteorologists will be able to use this information to make significantly more informed global weather forecasts.